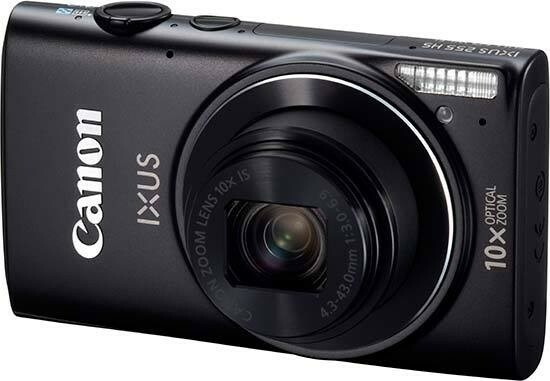 The Canon IXUS 255 HS (also known as the Canon PowerShot ELPH 330 HS) is a stylish digital compact camera that, from the outside, appears to break the rules, sporting a comparably meagre 12.1 megapixel CMOS sensor with a DIGIC 5 processor and a 10x optical zoom, all housed in a slim body complete with a 3-inch LCD screen, 1080p video and built-in wi-fi connectivity. Priced at a moderate £199.99 / $229.99, the IXUS 255 HS is available in black, silver and pink. In today's volatile consumerist market, many digital compact cameras are released with the sole intention of being a direct opponent for a rival manufacturer's camera. It's not often that you can open a box and say “wow” when you see what's inside. But that's what we thought when we opened up the Canon IXUS 255 HS for the first time. The curves of the case are only broken up by the occasional button and the 3 inch LCD screen – and only because it's too big for the back. In fact, the same goes for the lens but then it is a 10x optical zoom crammed into the thin shell. There are a number of interesting features on the IXUS 255 HS. The HS appendage denotes that the IXUS 255 uses Canon's High Sensitivity system. It's a combination of winning sensor technology and killer processor to make low light images (usually taken at high ISO with a lot of noise) look better quality. This could be a good indication as to the reason for the relatively low 12.1 megapixel resolution (by comparison). The less pixels on the sensor, the more space is available and so certain types of colour noise are avoided. These types of noise are created by pixels heating up while exposing and affecting neighbouring pixels. The ECO mode is a battery saving system that you have to enable in the Main menu. It's in the setup tab and you simply switch it to the On position to use it. It reduces the battery power consumption by adjusting the brightness of the screen. Why this isn't a standard feature (ECO all the time) is a bit of a puzzler, but then we'd complain about not having the option to take it out of ECO mode. We mentioned previously about how the processor can help with the HS system. The Canon IXUS 255 HS has been fitted with a DIGIC 5 processor. But what's different in the DIGIC 5 from the DIGIC 4? Quite a lot, says Canon. The 5 is a sort of light version of the 5+ which is seen in the top end DSLRs (the DIGIC 6 has only just been announced, so the 5 is current technology). According to Canon, it's 6x faster than the DIGIC 4, can efficiently run FullHD video, can manage faster frames per second (fps) at full resolution and – arguably more importantly – can handle image quality better, such as reducing noise. More and more digital compact cameras are being produced with wi-fi connectivity, but there's not generally a great deal that can be done with it. Usually, you can only upload your pictures to another device or website. Canon have gone to town though and squeezed every last bit of use from it. For example, you can download Canon CameraWindow app from App Store or Google Play and connect the camera to your phone for wireless control. You can use your phone as a GPS service to geotag your photographs. You can back-up your photos to a website or computer, print directly with a wi-fi enabled printer as well as the previously mentioned uploading to social media. All Canon digital compact cameras have two menus; one for quick access to frequently used features and one for more in-depth modes. The first is accessed by pressing the FUNC. SET button in the centre of the navigation pad. A small scrolling menu will pop up to the left. The colouring is orange on grey which wouldn't be our first choice, but does look quite nice. Here you can change the ISO, white-balance, resolution and shooting modes among other things. The main menu is plainly signed on the button and pressing it opens up a dedicated window to it. There are only two tabs so that it doesn't overwhelm the beginner. Because of only using two tabs, the menu is extremely easy to use, but we need to cover a few of the features to give an idea of what the camera is capable of for the newcomer to photography. The Camera tab is for features that directly affect the way the Canon IXUS 255 HS takes pictures such as Flash settings, Blink detection and Focusing modes. There's a nifty feature called iContrast towards the bottom which expands the dynamic range of the photographs. That means that if you're in a situation where there's a lot of contrast, the sensor normally will not be able to cope with the dark shadows and bright light. This will result in no detail in dark areas and burn out on the highlights. iContrast works to reduce the effect of this and balance out the exposure more. Flick over to the Setup menu and these modes will affect the camera in it's day to day operation such as noise control, date & time, power options and wi-fi settings. The previously mentioned ECO mode is found in this menu. The Canon IXUS 255 HS is very well made. It has a weight to it that keeps you aware of it's presence while shooting or sitting in your pocket. The tripod bush is metal for added durability and the only thing we'd liked to have seen is a lock on the battery cover. It snaps open, so isn't easily jostled while in a bag or pocket but there's also no metal on it, so it's more flexible than we're comfortable with. The thin lithium ion battery slots in alongside the SD memory card. Up to and including SDXC can be accepted in the 255 HS. One area of the build we really like is the size and sturdiness of the zoom lens. A 10x optical zoom in a little body such as this one isn't seen a lot, but it's great. There's very little movement in it when waggled from side to side. We also like the screen that Canon have fitted to the IXUS 255 HS. It's a little bit too big for the body and sticks out but it's much better to see a large screen. It's bright, colourful and contrasty. Continuous shooting on the Canon IXUS 255 HS is great. In the first second, the camera rattles off three pictures before slowing to a steady two fps therein. We captured 21 pictures in a ten second period indicating a 2.1fps performance. Download time to the card is fast too at only a couple of seconds for all those pictures. This shows what the lower resolution and faster processor does for you and is great for a little compact. Should you find yourself needing the camera on quickly, from the off position, the 255 HS can turn on, focus and take a picture in two seconds. That's half a second faster than a typical digital compact camera. The Canon IXUS 255 HS can be switched on to review pictures whether it's powered up or not. If it's off, simply hold the button down a bit longer and it will come to life. Pictures are shown full screen as default but pressing the DISP. button will scroll through the options of information you want to have on screen. For instance, you can have no info, basic info such as the resolution, date & time and file number or you can go the whole hog and have all shooting information displayed with a thumbnail of the picture and even a histogram. There's a Function menu in playback and brings up features such as the delete button (for that one image you're on), favourite, lock and rotate. There's also an Image search feature which will look for pictures using their date, favourites – if you have any or people – using face detection among others. Directly under the box opening is a small card tray which holds the software and manuals. The booklet is only a brief manual with the full manual being stored electronically on the CD. The CD also contains a picture viewing suite which offers basic editing and tagging. Beneath this is the camera with a battery, charger, wrist strap and USB cable.